The on-loan Nottingham Forest winger tasted his first clash against the Ibrox side in the claret and amber and put in another impressive display to add to a growing tally this season. He was instrumental as Well put the visitors under sustained pressure for the opening quarter of the match, before Scott Arfield was gifted the game’s opening goal. And they were to pay for not making their good play throughout the match count, as the Gers added two further goals to run away comfortable winners. The 24-year-old said: “It’s a bit of disappointing result, but we have to take positives from the game. I felt we were the better team for the first 20 or 25 minutes and played really well, with some good chances. “We had good possession, moved the ball quite well and were confident to create opportunities and match them. The American midfielder is one of the young influx of talent being given a chance to flourish in the first team by boss Stephen Robinson alongside home-grown talents such as David Turnbull and Allan Campbell. He said: “It was definitely a good occasion for me to be part of and it was one of the games that was important in terms of developing as a player, so the experience will definitely help. 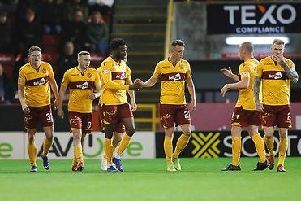 Speaking of big matches, Motherwell will begin their post-split Premiership campaign with a trip to local rivals Hamilton, whom they have already got the better of twice this season. And after falling short of their top six ambitions, Ariyibi says that the squad is motivated to finish the season on a high note and secure a seventh place finish. Ariyibi added: “It’s important that we try and finish as high as possible and we’re feeling confident heading into those games, the boys are positive about every game we go into and the fans will keep supporting us, so we need to make we end the season strongly.